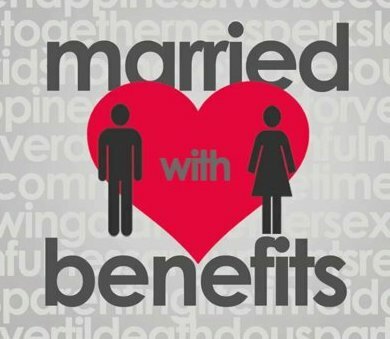 The Benefits - Why Get Married? "We've been living together for 5 years and we're happy. Why ruin a good thing? " "My parents got divorced, so I don't believe in marriage as an institution." Filing joint income tax returns with the IRS and state taxing authorities. Creating a "family partnership" under federal tax laws, which allows you to divide business income among family members. Obtaining priority if a conservator needs to be appointed for your spouse -- that is, someone to make financial and/or medical decisions on your spouse's behalf. Enjoy discounts on your Home and Auto policies. Purchase Life Insurance for your Spouse to protect your family's future. Taking bereavement leave if your spouse or one of your spouse's close relatives dies. Living in neighborhoods zoned for "families only." Claiming the marital communications privilege, which means a court can't force you to disclose the contents of confidential communications between you and your spouse during your marriage. Visiting rights in jails and other places where visitors are restricted to immediate family. Go ahead and pop the question and give me a call!!! Amy Pulver also known as the KC Minister of Love is not an attorney and cannot give you any legal advice, this is just for informational purposes only!